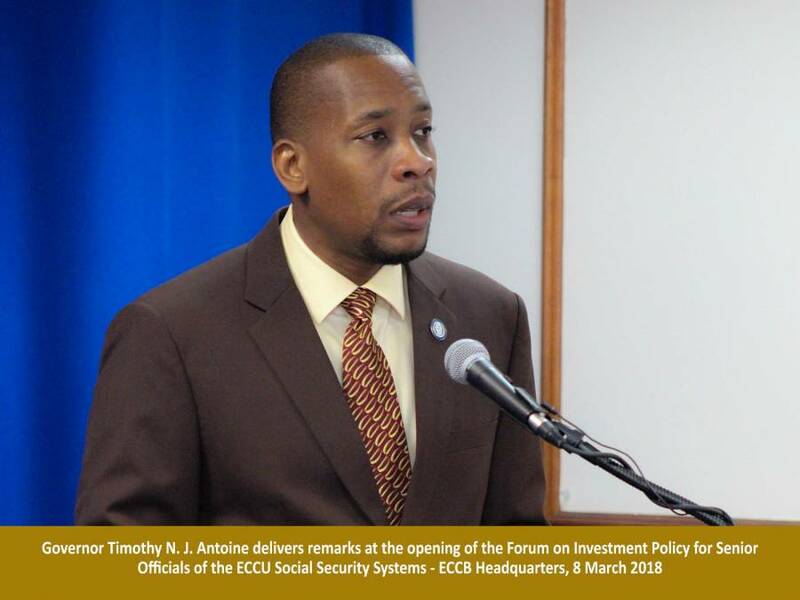 Governor of the Eastern Caribbean Central Bank (ECCB) Timothy NJ Antoine has given the assurance that the bank is committed to working with the various Social Security Systems across the Eastern Caribbean Currency Union (ECCU) in their efforts to ensure the well-being of pensioners. Speaking at the Forum on Investment Policy for Senior Officials in the ECCU Social Security Systems, Governor Antoine said that the performance of Social Security systems impacted all the nerve centres of the ECCB’s mandates thus, there was need for continued collaboration between the bank and social security for the viability of the ECCU. He added that given the strategic importance of the Social Security Systems to the Currency Union, the ECCB was prepared to listen attentively to the challenges and assist where possible, particularly in advocating for the much-needed reforms. The Investment Forum was held at the ECCB Headquarters, from 8 to 9 March, held under the theme: Protecting and Growing the Investment Portfolio. It focused on the challenges Social Security Boards are facing and sought to chart a way forward to help mitigate risk, ensure safety of funds and grow investment portfolios.